The dish was, of course, fantastic! We still remember the meal as one of the best on our trip. 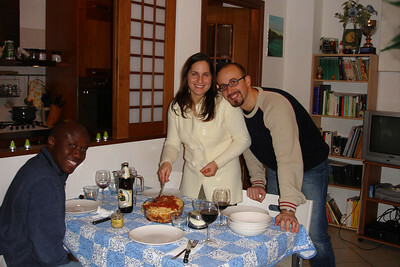 We are still in touch with them and they now have a son, Marco, about a year older than Esther. We sent him a shirt for his first birthday. We received this photo this week. Winter weather has hit Seattle! We have managed to get out a few times but have mostly laid around the apartment. There has been plenty of snow and ice. Seattleites are big wimps when it comes to winter weather. No one knows how to drive in it. It does not help that most of the neighborhoods in Seattle are hills – Capitol Hill, Beacon Hill, Queen Anne Hill, Crown Hill, First Hill (aka Pill Hill for all the hospitals there), etc. 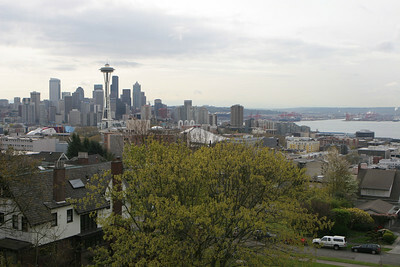 Queen Anne Hill is incredibly steep with old maze-like mostly dead end streets obviously laid out before cars. It is one of the richest neighborhoods in the city which means that the streets are lined with very expensive luxury cars. Julius was up there today and reported that all the streets still open (the few that are big enough for melting/sanding) were now lined with dented and scratched luxury cars. Moral? Don’t drive on Queen Anne right now. It can be expensive if they catch you. On Wednesday schools were closed because there might be snow (there wasn’t). After that embarrassment we were redeemed when snow arrived on Thursday. It was bad. The incident that got the local news really hysterical was today when two buses that went down a steep, icy street on Capitol Hill and came thisclose to flying through a barrier and flying who knows how many feet to the freeway below. This better put us on national news. If Spokane can be mentioned on Morning Edition for breaking some 120 year old snow record, we should be featured for this. Forecast for Sunday – snow followed by freezing rain and 70 mph winds. Stay tuned. I just hope we keep power. After Esther was born my mom moved in for three weeks to help us transition into parenthood. 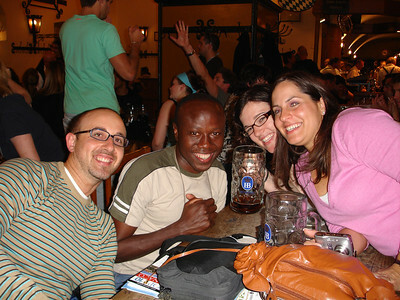 It was great – a custom practiced around the world that has been often neglected in the States. On her first day in our home she quickly decided we did not have enough freezer space. She was right, of course. This problem was compounded by the fact that I cooked a huge pot of Mtori (a Tanzanian soup women eat post-delivery) and loaves of zucchini bread during my nesting phase. With a visit to Sears.com she ordered us a half-chest freezer and Julius picked it up that day. It was fabulous. Relatives brought meals to stock it along with many trips to Costco and Trader Joes. By October we realized that things had gotten out of hand. Our freezers were both full and we were eating mostly out of the fridge! Thus, our freezer challenge. Starting in October we decided that we would do no more grocery shopping until both freezers were emptied of food. The only things we were allowed to buy were condiments, milk, eggs, flour for bread and satsumas (they only come once a year and we need to eat them while they are in the stores). It turned out to be a lot more food than we thought. Now we are coming into mid-December and we have about a week and a half worth of food left. We have wittled it down to two packages of chicken, a severly freezer burned piece of salmon (hopefully no more than nine months old), a mexican dish from my cousin, vegetarian chili, shrimp scampi and tail-on shrimp. We also agreed to try and use all the dry goods in the cupboard so we have been eating a lot of beans, curry, coconut milk and rice. I even made a dessert out of the sweet sticky rice that I bought by mistake at the Asian grocery. It has been a great challenge that has saved us a lot of money on groceries. I, however, am most looking forward to the shopping sprees that we will take to Cash and Carry, Costco and Trader Joes when it is finally over. For anyone in my line of work (Maternity Nursing) this top-ten list from Babycenter.com was a no brainer. In fact, I could have predicted the outcome in July. Maybe now people will realize that we weren't kidding when we said all year Sophia is going to be the #1 baby name. Also, I will say that if Jack and Jackson were combined, they would probably be #2. We gets so many people naming their boys that name now. And, really, the Aiden, Cayden, Haiden, Brayden, Jayden, Zaiden trend has to stop (yes, I have heard them all from patients, in countless different spellings).The Addison trend does not surprise me either. The name came out of nowhere and I now hear it all the time. Baby naming is a topic that I have become a bit obsessed with since I got this job. Nothing pleases me more than patients who pick fabulous names for their children. It is an equal downer when people pick ridiculous or super-common names. I do feel bad for the people who didn't realize that Addison would be so common when they picked it (Thanks, Grey's Anatomy). Any of you who have read Freakonomics know how names become trends. For those who have not read it, you can read a summary of the baby name chapter on Slate here and here. We have been closely following the presidential primary run-up and are very pleased to see that our candidate of choice, Barack Obama, won in Iowa by a wide margin. We have been fans of Obama since his 2004 speech at the Democratic Convention. It doesn't hurt that he has some roots in the same part of the world as Julius. While his father has been outed as a drunk, egomaniacal, wife beating, polygamist, Obama never knew him and has embraced the rest of his extended family and many half-siblings in Kenya. Africans are all anticipating that his ties to their continent can only mean good things if he does become president. Like the rest of attention-hungry world we enjoy posting our videos on You Tube then waiting to see who watches them. The first thing that surprised me with You Tube is how many people post the same videos of the same things. Some of our videos I assumed would be really original ("Wait until they see this video of traffic in Vietnam!"). Once the video is uploaded, however, You Tube will show a list similar videos. We learned quickly that we were not the only people to be entranced by the organic system that is Vietnamese traffic. Hundreds of people have posted videos of Vietnam traffic and many better than ours. In fact, we spent a fun two hours looking at them. It does make sense that Vietnamese traffic warrants a lot of videos. However, an old street musician in Brussels? He had five separate videos (at least) posted by tourists like us. Lace makers in Brugge, Belgium have dozens as does the Sea Organ in Zadar, Croatia, splashing fish at the Hong Kong Market and a guy who sings at the Rarotonga Airport in the Cook Islands. When we do post a video that is original it is pretty exciting. For example, we are the only people to post videos of singing Tanzanian and Ugandan nuns. Some of our videos have become popular (relatively speaking, of course) and have earned us a fair number of views and comments. Most of this attention is thanks to some nice person posting our video on a discussion board or on their own websites. Our most visited videos are the lace making ones we took in Belgium (which are featured on a website for lace makers) and the videos we took of an Italian Bagpipe player and a Hurdy Gurdy player on an outing with our cousin Maria and her father in Italy. These videos turned out great and are very topic specific so they are posted on a lot of bagpipe and hurdy gurdy sites. 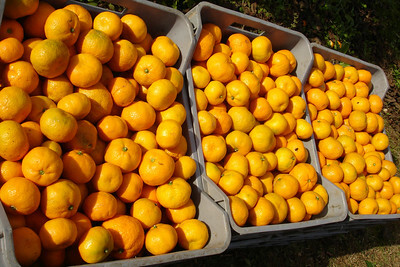 Now that Christmas is getting closer, the Satsuma oranges have arrived in the produce section of all the supermarkets. Satsumas have to be one of the greatest fruits ever. We eat about two boxes a week during their short season. Last December when we were in Brijesta, a small fishing village on the Croatian coast where my great-grandparents were from, satsuma harvest was in full swing. We were told to eat as much as we could. Between us we probably polished of 40 a day. 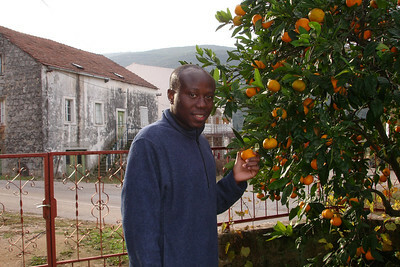 It turns out that this part of Croatia grows the satsumas for most of Europe. 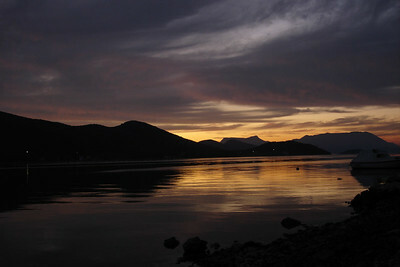 Along with satsumas we ate a lot of olive oil and mussels, their other main crops. Other than eating we visited with family and enjoyed the amazing views. Where were we one year ago today? After settling back into our life, we sometimes forget to look back at our nine months of traveling. It is fun to check our journal and see what we were doing last year at this time. 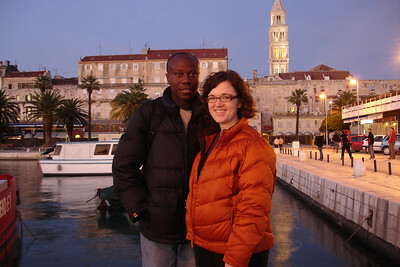 Today we traveled from Split to Dubrovnik in Croatia, along one of the most beautiful coastal highways in the world. Everyone needs to visit this fabulous country. Hi Everyone! Welcome to our new blog. After blogging around the world on our Travelpod page we thought it would be fun to have a permanent blog on our website. After struggling a bit with the setup (thanks to Jenn at our host Crosswinds for figuring it all out!) we are now ready to post. Now the question is: what do we blog about? Stay tuned….